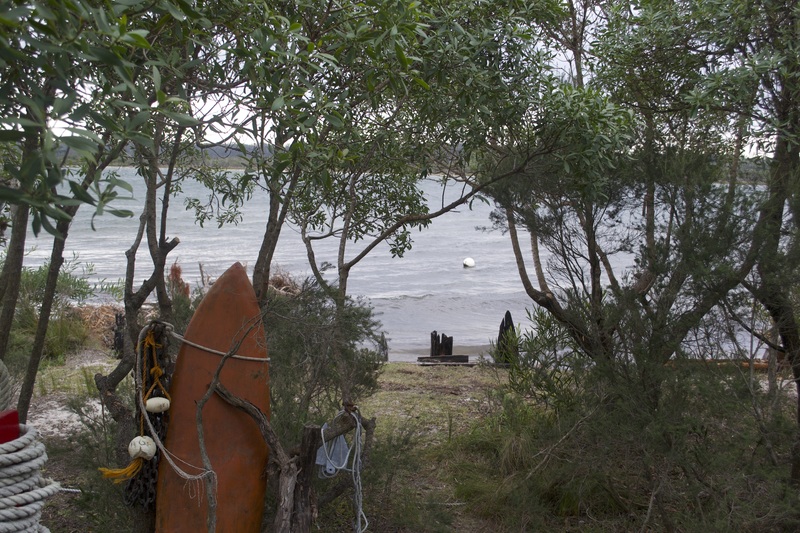 The foreshore of Sally Allen's property on the outer barrier, Lakes Entrance. 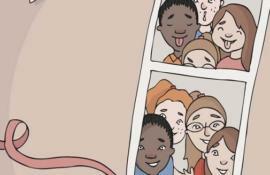 When she retired, Sally Allen returned to the place she had spent summer holidays as a child. She built a breezy off-grid house on the outer barrier, a narrow sand dune near Lakes Entrance, a fishing town on the East Gippsland coast. The barrier is quiet except for the lapping water and wind. There are only a handful of holiday homes and no other permanent residents. Sally Allen has already observed what she suspects are the impacts of rising seas. You can’t get to Allen’s place by car. Town is a 15-minute journey away in her beloved outboard dinghy. One of her weekly tasks is laying out bracken and driftwood along on the shoreline to try and fortify her vanishing beach. The unique area is subject to complex planning laws, along with state-wide guidelines adopted after the 2009 Victorian Bushfires Royal Commission. According to the municipal fire authority, all building on the outer barrier needs to be approved individually by the state planning department. Sally says those restrictions have put the value of her house in doubt, without making her any safer. Declining property values, red tape and risk – it’s a combination giving residents of Lakes Entrance an early glimpse of a climate-changed future. But restrictive planning controls, many of them evolving in recognition of risks of wildfire and sea level rise, are blamed by some for the township’s economic downturn, and for fuelling tensions about how to adapt to climate change. “It makes you realise as a citizen how powerless I am,” Allen says. She argues that some of the rules that emerged from the Victorian Bushfires Royal Commission were “made for the geography in a completely different place, but it’s now affecting me and there’s absolutely nothing I can do about it”. But Allen’s home is squarely in the firing line of sea-level rise, which looms as an unstoppable threat to at least some degree, depending on humanity’s response in the next crucial decade. 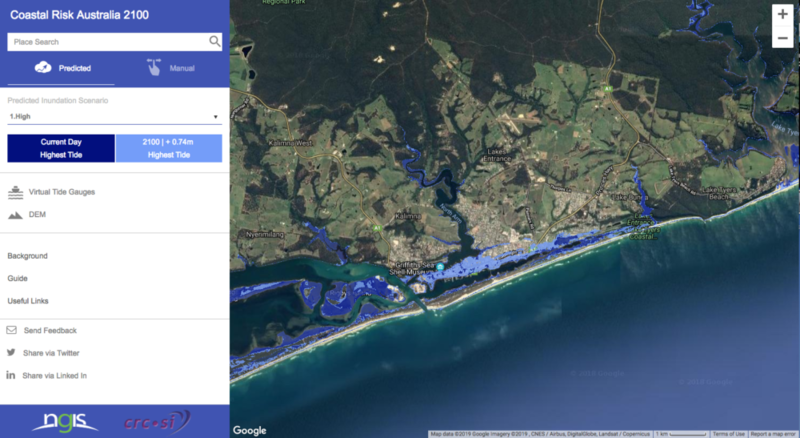 With key commercial areas of the town sitting just two metres above sea level, scientific modelling shows Lakes Entrance is highly vulnerable to rising seas. 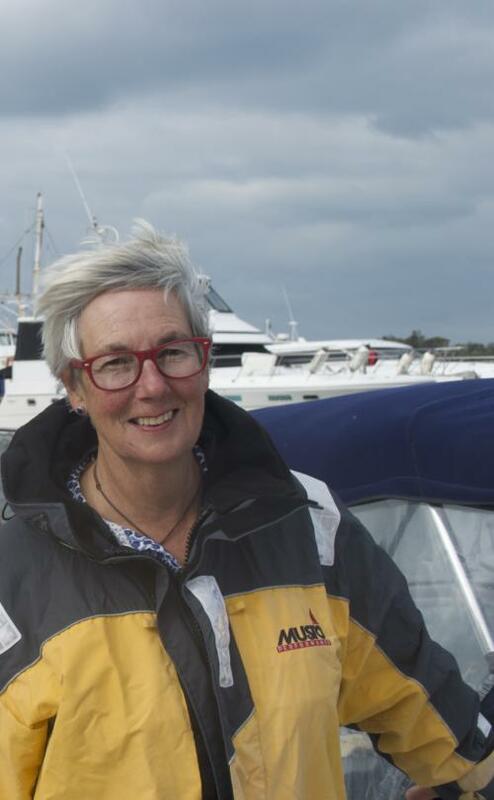 East Gippsland Shire Council’s director of community and strategic development, Kate Nelson, says tighter building restrictions – including limiting further development on the outer barrier – are appropriate, although the council wasn’t always of that view. When the rules initially came into effect, the municipality asked the Victorian Civil and Administrative Tribunal for an exemption, but was refused. “(VCAT) said – ‘What are you actually proposing here? Are you thinking clearly about this? What about climate change? What about sea-level rise? What about bushfire? What about flooding?’ It’s the full suite of stuff we have to deal with here,” Nelson recalls. She says adapting to the effects of climate change on the outer barrier is a necessity. “We’re working out a long-term strategy of how to manage development and change along there over time.” Throughout this year, she will have a rolling program of conversation with residents about climate adaptation. Sally Allen has already observed what she suspects are the impacts of rising seas. Cruising along in the water in her dinghy, she points out four docking poles. 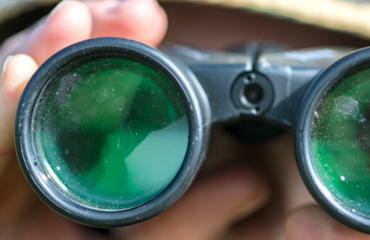 “See those? They used to be on the beach,” she says, adding that it’s “not particularly” a high tide when we visit. 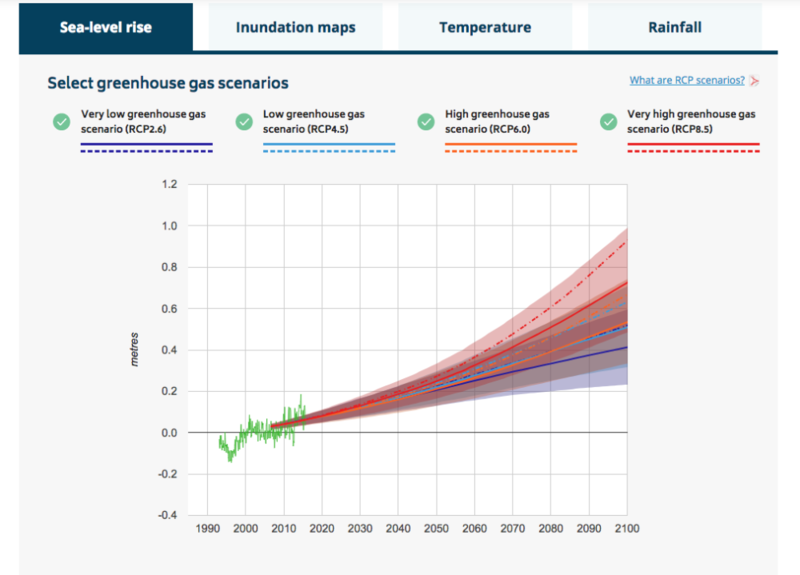 A very high greenhouse gas emissions scenario – close to the trajectory humanity is currently tracking – puts sea-level rise along the East Gippsland coast at 0.9 metres by 2100, according to CoastAdapt, a climate information tool. The most recent report from the Intergovernmental Panel on Climate Change warns that there are just 12 years remaining to turn that trajectory around, and have any prospect of capping warming at 1.5 degrees. This map prepared by Coastal Risk Australia models high tides in 2100 around Lakes Entrance and the Gippsland Lakes. It presumes a low emissions scenario, which is close to the present course. Dark blue shows present day highest tides; light blue models highest tides in 2100. 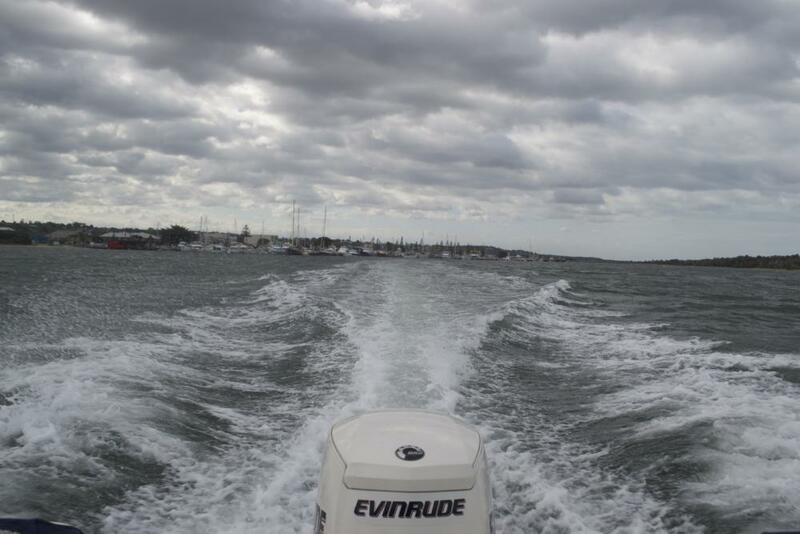 It may not sound like much, but in Lakes Entrance, which has always seen periodic flooding and draining through the lakes, any rise in the water level brings increased risk in the event of extreme weather. “A lot of people see sea-level rise as incremental and therefore nothing to worry about,” says senior CSIRO climate scientist Dr Kathleen McInnes, “But we really do need to think about it. McInnes conducted modelling for CSIRO showing that wind surges are becoming more common along Victoria’s east coast. She says this is due to the expanding tropical zone, pushing strong sub-tropical winds – which can cause hurricanes – further south. So far, the state response has been through planning, adding a measure for sea-level rise to existing requirements. A benchmark for 0.2 metres of sea-level rise by 2040, and at least 0.8 metres by 2100 was set by the Victorian Government in 2008. The sea-level requirement is on top of flood predictions for a 1-in-100-year flood in the Gippsland Lakes, set by the Catchment Management Authority. 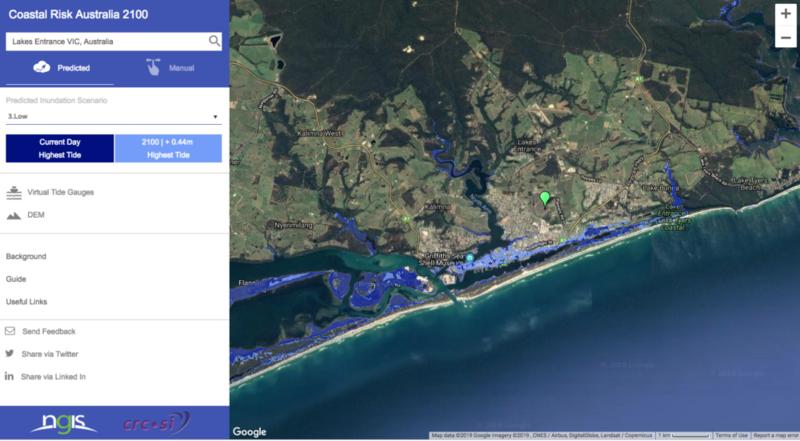 A walk around Lakes Entrance township is like a tour through changing flood predictions. Newer buildings are set up high, with some entrances nearly a metre above the ground, while the older motels and shops are much lower. The North Head shoreline – home to a strip of businesses including a newly elevated mini golf, and the dusty Museum of Shells, presided over by a giant speckled fibreglass octopus – is one of the most vulnerable areas. It’s not only the height of floors, but large developments that are restricted. A 2010 planning tribunal case found a planned eight-unit townhouse development on the North Head presented “unacceptable” levels of “risk and hazard” due to climate impacts. Ever since, guidelines have stated that development should ideally be avoided altogether “in areas susceptible to inundation”. But in Lakes Entrance, that means most of the town. Even the local Woolworths sits on an infilled, muddy sand dune surrounded by water. Planning constraints also affect surrounding roads and exit points, making large developments like apartments and accommodation prohibitive, where large numbers of people might need to evacuate at once. “It comes back to the level of risk we’re allowed to put people in,” Nelson says. Here, the impacts from sea-level rise are not distant possibilities, but are already shaping people’s lives – first through the planning scheme. Development has slowed and insurance premiums are on the rise according to fisherman, Arthur Allen (no relation to Sally) who has lived in Lakes all his life. He sees the adaptation measures as an “extreme” imposition in daily life, and he’s not happy about it. “It’s all just based on what might happen,” he says. Allen has tried to open a shop-front for his fishing co-op in the town for over six years, but says he has been unable to afford the consulting fees to satisfy planning requirements. There are (at the time of publication) 44 businesses listed for sale in Lakes Entrance, 22 of them located along the town’s main strip, the lakeside Esplanade. With the downturn in the job market, Allen’s kids have had to go elsewhere to find work. Census data reveals a town that would struggle to afford the costs of a changing climate. Figures from 2016 show weekly household incomes were $615 below the state average, and unemployment was at 8.9 per cent. A quarter of homes were still not connected to the internet, a key indicator of disadvantage. Nelson says that inequality is a key factor in planning for climate adaptation. High levels of home ownership also mean people have their savings invested in Lakes Entrance. Allen is already feeling the costs. He says the insurance industry has used climate change to justify raising prices, even though flooding has always been a fact of life in the lakeside town. “Every year our insurance goes up due to being in a flood-prone area. There should be a royal commission into the insurance industry,” he says. “There’s towns dying all around the coast because of this,” he says. His anger at what has happened to the town has fuelled his scepticism of the science anticipating rising seas. He recalls “playing in the backyard in three feet of water” as a child. “[Flooding] has always just been a normal part of living here,” he says. Eric Sjerp, a scientist who has modelled sea-level rise impacts for the Gippsland Coastal Board, agrees that the naturally “transient” estuary landscape has and always would experience flooding and erosion irrespective of climate change. “Climate change, or more accurately, sea-level rise, is just one more factor contributing to those changes,” he says. Seven rivers flow into the Gippsland Lakes, with Lakes Entrance at the base. An artificial cut in the outer dune barrier – the “entrance” – allows the water to escape into the sea. Sjerp says that “the Lakes act like a giant bathtub. “If you have a high rainfall event coming down the rivers into the lakes, and a storm or high tide preventing water going out the entrance, then the water will collect in the lakes and inundate low-lying areas, including the town,” he says. McInnes says the combined risks could produce “rapid” floods unlike the relatively calm rising waters residents are used to. Nelson hasn’t ruled out a strategic retreat from the coast. “There may be a point where we say, this isn’t working anymore, and we do decide to leave the coast. But that would change the whole character of Lakes Entrance,” she says. The first stage of the adaptation project involves scoping “sites of value” to the community. Nelson says that climate adaptation needed to be “very place-specific,” and not only managed at the planning level. But Arthur Allen describes the state-wide regulations as “bureaucratic box-ticking. 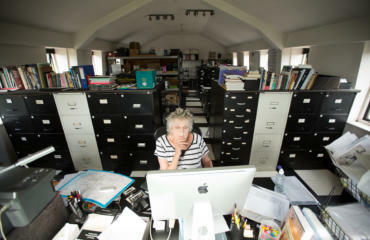 Sally Allen, however, worries about the changing climate. “We’ll see the dramatic effect of storms and climatic events that are going to be more extreme,” she says. Right now, her immediate concern is the uncertainty over what would happen if her house was destroyed or damaged. “I can’t rebuild where I am. So actually, if there is a fire, I’m more likely to stay and defend my house because it’s the only asset I’ve got,” Sally says. It’s a balancing act that the town, like others around the world, continues to grapple with.